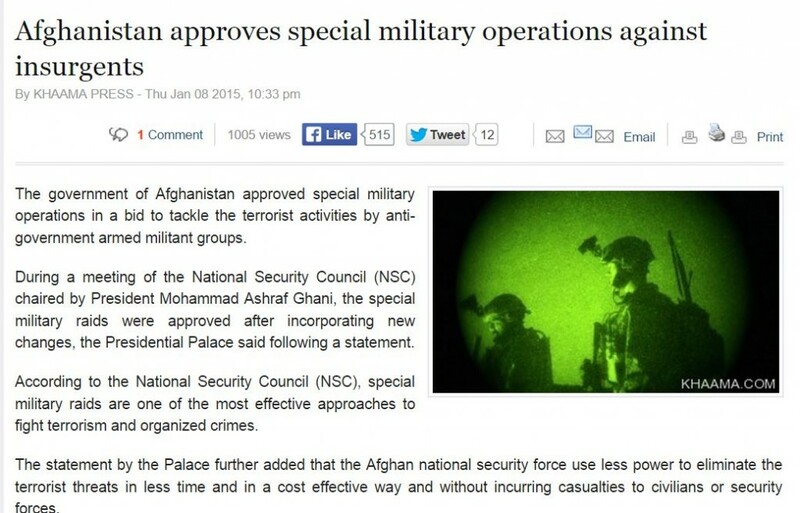 President Obama, as you’ve likely heard, just announced an extension of the Afghan mission. He insists combat operations in Afghanistan are over. He insists the role of the “train, advise, assist” advisors on the ground won’t change. Our troops just need to stick around in Afghanistan until the training begins to take hold. I’m most interested in the timing of this announcement. It comes 12 days after Americans — working at the behest of the Afghans we’re “train, advise, assisting” — destroyed a Médecins Sans Frontières hospital in Kunduz. Afghan commander General John Campbell, on a pre-planned trip to testify about how we need to extend our deployment, also answered questions about the attack and promised an investigation; he even suggested a preliminary investigation should be done within a month (so within the next 20 days). Lucky for Obama, American reporters have short memories, otherwise some might ask him about the combat role these TAA advisors played two weeks ago today, returning fire against Taliban forces, just before the US destroyed a hospital. Because then we might be focusing on how Kunduz underscored that Americans will still be drawn into fighting. But it’s the MSF bombing that would really undercut Obama’s decision to have us stay. Probably, the DOD investigation is going to show that the Afghans made unjustified claims about the Taliban operating from the hospital, most charitably because of confusion, but possibly because they didn’t like that the hospital treated Taliban members (and likely was treating some from fighting earlier in the week). It will also show Special Operations process on vetting totally violated protocol, which will raise more questions about precisely what role SOF is playing on the ground (and how our counterterrorism operations, such as this was, threaten to drag us back in). So Obama rolled out his decision in that sweet spot, where most of the big reporting on the MSF attack has passed, but before the report will renew attention on precisely what we’re doing in Afghanistan. One other point about Obama’s decision. In his announcement today — and in Campbell’s testimony last week — both men raved about what a great partner Ashraf Ghani is (both also made overly optimistic claims about how well power sharing is working). That should make it clear — if this analysis wasn’t already enough — that the shut-down of NSA’s full take on Afghanistan cell phone content that happened after WaPo and Intercept described the MYSTIC/SOMALGET programs has since been reversed. It’s clear Ghani has agreed to do what we have asked in order to get us to stay, and we surely asked for turn the full take back on, for troop protection if not to better spy on the Taliban. Which, of course, would indicate Clapper was lying again. Finally, MSF has not backed off its demand for an independent investigation. It just launched a Change.org petition calling on President Obama to consent to an independent investigation.